Allows you to set the tone. Catering the meeting allows you to choose the menu and set the mood for your time together. Do you want the meeting to have a high level of formality? Or do you want to give a more casual, approachable feel? The food you serve can help communicate the message you want heard. More efficient meetings. Driving to a restaurant, waiting for food to arrive, waiting for the bill, driving back… All that time and waiting adds up. Bringing a caterer to your meeting makes more time for you to get business done. You can impress your clients. There’s something very personal and professional about having a catered meal brought in. 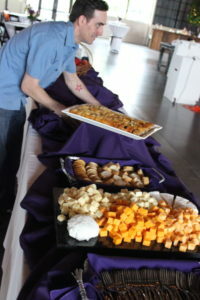 Aside from that, working with a caterer, you can “show off” your area’s cuisine to out-of-town guests. Provides a better setting for large groups. Taking one or two people out for a meal isn’t a big deal, but what do you do when you need to meet with a large team? Catering client meetings at your office is the perfect way to handle that scenario. You don’t have to deal with a loud restaurant so communicating is easier. You don’t have to deal with long wait times because the food is specially prepared just for your group. Catered meals can be customized. Whatever your specific needs are, a good caterer will be able to accommodate. If you need a buffet-style breakfast or lunch, that can easily be accomplished. If you’d like to serve a sit-down dinner, that can be arranged. Catering client meetings especially makes it easier to serve clients who may have food allergies since you can build the menu around options they can enjoy. A savvy catered can even make you more productive. Did you know certain foods can boost brain productivity and alertness? Did you also know certain foods can have the opposite effect and cause drowsiness? If you really want to take your meeting to the next level, you can work with your caterer to serve “brain foods” to your team. No matter the size of your meeting or the needs you have, Chef du Jour has years of experience catering client meetings for businesses in the Portland area. We would love the opportunity to serve you and help make your important business meetings a success!